It’s Monday, again?! Ugh…have a drink to celebrate! 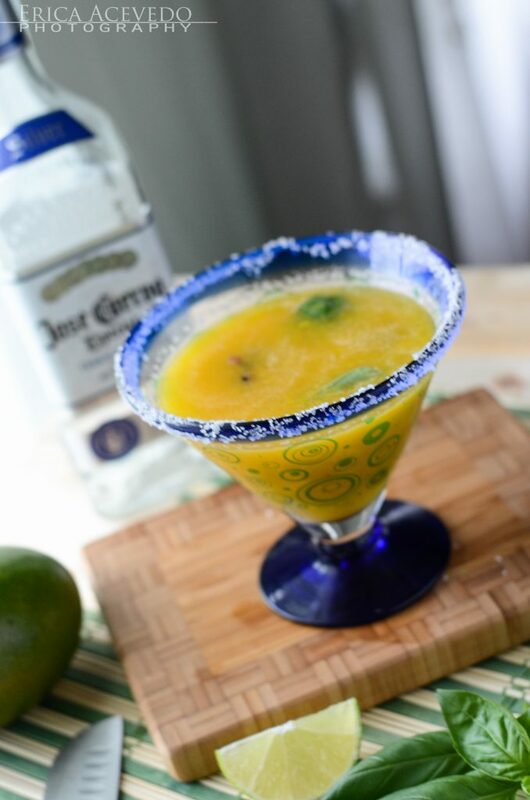 Margaritas are a staple in our home. Mr. Crumby is Dominican, and while he is mainly a Presidente man, his favorite cocktail is a standard frozen margarita. We’re usually too lazy to pull out the blender and mess with the ice, though, so it’s usually just on the rocks unless we’re out and about, drinking in places where those extra steps aren’t a hassle. 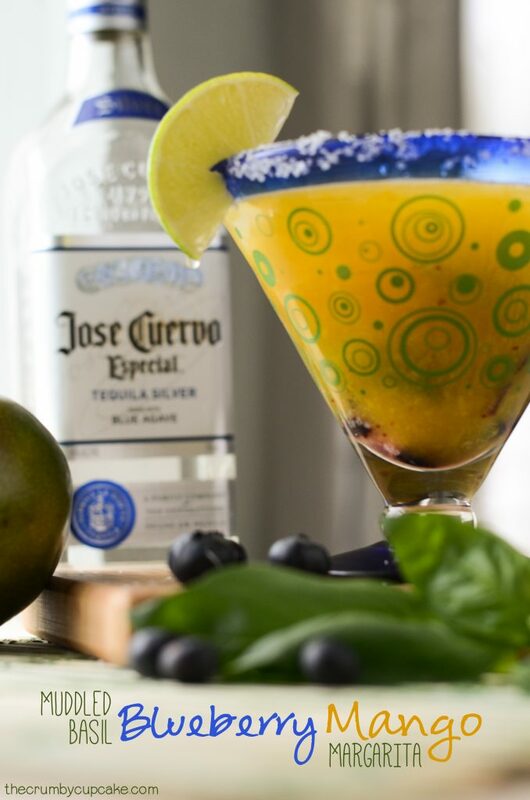 We don’t just use margarita mix, either. It’s freshly squeezed limes all the way. The first time I had a fresh margarita, I knew I could never go back to that bottled mixer abomination. Even looking at the ingredient label makes me cringe. High fructose corn syrup does not belong in my beverage, mmkay? That, and the booze. Drinking around the (mini) world is the most fun. Ever. I’ll have to document next time we go and share, so you can all appreciate it. Anyway, the main parts to this margarita are mostly what you’d expect: lime juice, tequila, mango, orange juice. It’s the addition of the blueberries and basil that threw me. BASIL? In a drink?! I’ve heard of mint, even jalapenos; but basil is something I eat with tomatoes and mozzarella…in my pasta sauce…as a pesto. NOT in my lime-a-licious, boozy margarita. How. Freaking. Delicious. Basil is, in this thing. It offsets the acidity of the citrus perfectly, and cuts the bite from the alcohol just enough. I’d never “muddled” anything into a drink, but it turns out it’s really not difficult. You can do it in a cocktail shaker, if you prefer, but I just used a pestle and smashed the blueberries and basil into the bottom of the glass after pouring in the margarita itself. Now, I just need to learn how to turn my black thumb into a green one, so I can stop killing my basil plants. I need one of these margaritas at LEAST once a week. 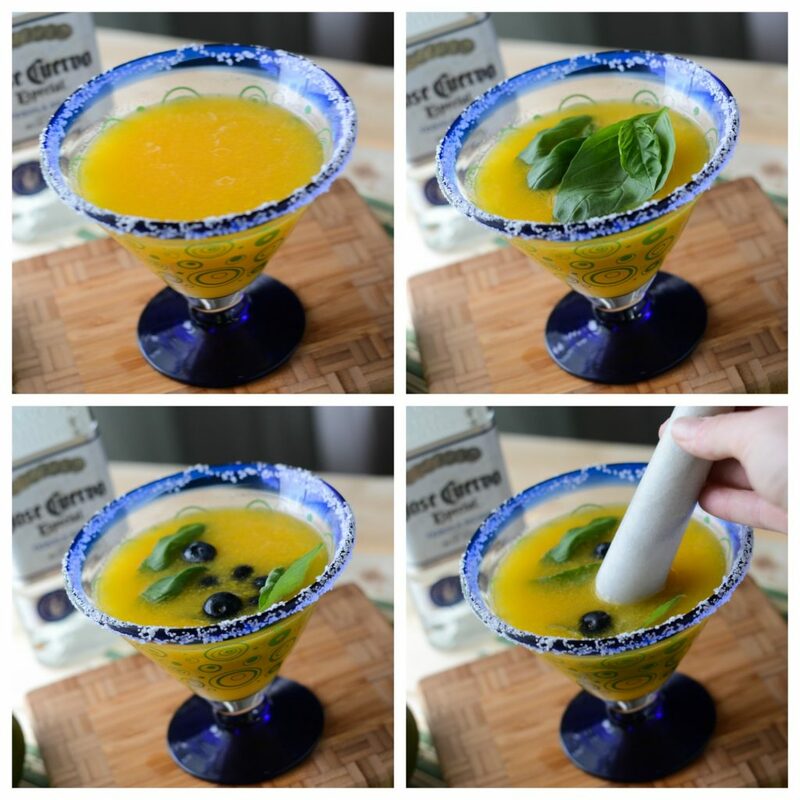 A delicious, refreshing basil-infused blueberry mango margarita. Coat rim of margarita glasses with juice from a lime wedge, then dip rim into salt. Set aside. 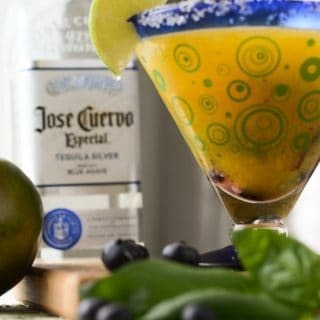 Combine tequila, orange liqueur, mango puree, orange juice, lime juice, and agave nectar in a cocktail shaker or pitcher and shake/stir. Pour juice mix evenly into margarita glasses. Add 2-3 basil leaves and 1 oz. blueberries to each glass. Using a muddler (or pestle), press down lightly on the leaves and blueberries and give a few gentle twists, releasing the blueberry juice and basil fragrance into the drink. 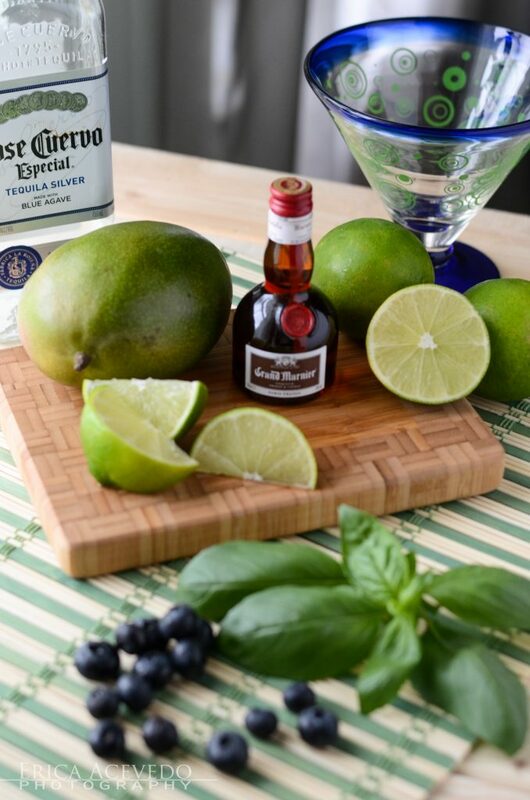 Add ice cubes if desired, and garnish with a slice of lime.